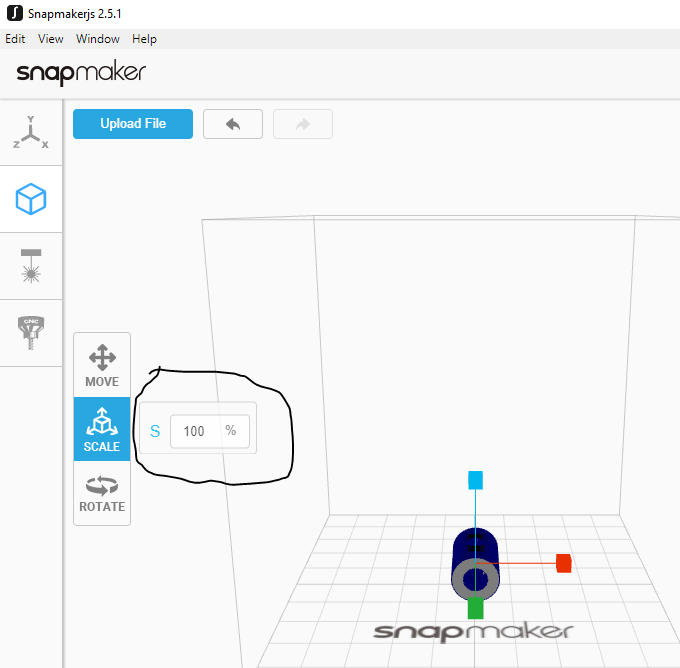 This is the beta version of Snapmakerjs v2.5.1, we’ve made some big changes on Laser G-code Generator. Please check it out and any feedback is appreciated! How about still adding the possibility to adjust support printing speed? It’s too noisy at current unadjustable speed for example for night printing. Tried the beta 5 and the top / bottom seems to be ok. The wall thickness is still wonky. Yes we use wall count = wall thickness / layer height to calculate the wall count. As you see in the preview, setting wall thickness to 2 with layer height is 0.2, you will have 10 walls: 1 outer wall and 9 inner walls (see the red line and green lines). The issue I found is with the laser module. When importing a SVG the vector is offset and I can’t it in the right place making it harder to engraving/cut. The vector doesn’t stay inside of the frame, also it scale it to 125 x 125 by default if it can, instead of just leaving it with imported size. It’s not always that we want to scale it. The imported SVG has the right size already. With the offset issue, if I try to run the boundaries, it goes outside of the boundaries which is blocked by the axis motor. With 2.5.0 there is no issue. on the picture I’d expect the gear to be inside of the frame not on the bottom right with parts outside of the frame. I would like to see the ability to change the scale on the X, Y and Z values like other slicer applications can. Yes, but the wall thickness does depend on the nozzle diameter and not on the layer height. So I tested it and 1mm wall with 0,2mm layer is 5 walls (2mm wall thickness in reality) and with 0,1mm it’s 10 walls (4mm wall thickness in reality). I even printed it and measured the wall thickness, as expected it was 2mm for the 0,2mm layer and 4mm for the 0,1mm layer model. I know your issue now. Currently we don’t add any restrictions to wall line width based on nozzle diameter, which causes the problem. The smaller layer height is, the more obvious the diff will be. Errr…I’ll try to fix it in the next few versions. Could you provide your SVG file (Or a simplified version) for us to test? It’s an SVG parse problem we can solve, the boundary is what it suppose to be, but the preview is what the G-code locates. the Process-bar Parsing G-Code (after slicing has finished)… stops very close to its beginning. BUT! If you make the snapmaker window very very small (only the Generate G-Code button is visible scroll this to center and minimize window after pressing this and wait servaral minutes), then generation terminates successfully. This is a crazy about 50% workaround. Uh, and another issue is, if you export this model there is an error, that says : Generated G-code overstepped out of the cube, please modify your model and re-generate G-code. This is not the truth, the model is in box ! I found this too when I try to print the Snapmaker Box. We will fix this soon. I would love to see the ability to save (and name) custom filiment profiles (like we can for speeds). This would be great so I don’t have to rely on me writing them down I can just go back to the last saved profile for a particular spool of material.